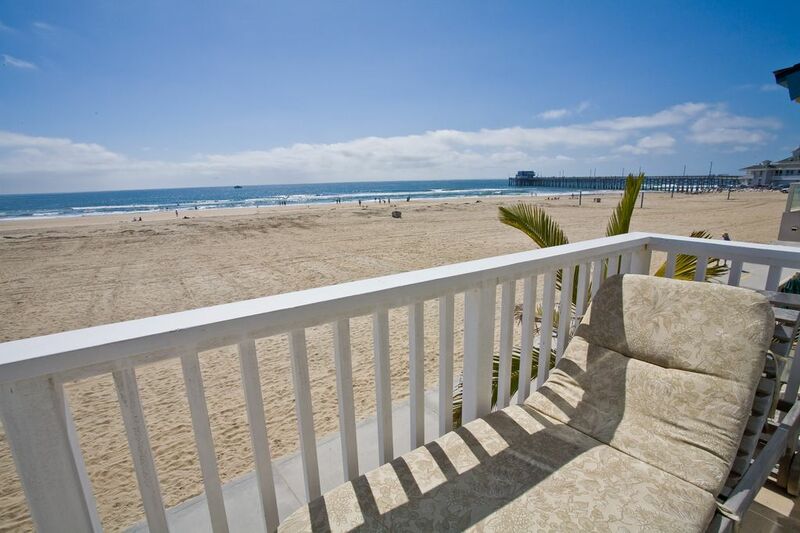 On the boardwalk just south of the Newport pier, this lovely single-family beachfront home is ideal for people watching and fabulous views of the surf and the pier. Listen to the sound of the surf from the ground floor living space, second story master and the rooftop deck. Brand new porcelain plank floors look like hardwood but give the home a clean, beachy feel. The living area opens out onto the patio right on the boardwalk, with a couple of chairs and a small table near the palm tree. Inside, a large comfortable couch, loveseat with matching chair and a coffee table make the room perfect for the whole clan to watch surfers (and the occasional dolphin!) ride the waves out front, catch favorite TV shows or, on cool nights, enjoy the gas fireplace. Granite counters accent the compact kitchen. Enjoy postcard views while prepping meals or enlist the kids to help up at the island with two stools. A walk-in pantry and half bath add convenience. Gathering the family for meals is a breeze at the large wood dining table with two armchairs, two side chairs and a bench. A large laundry room on the second floor has a full-size washer and dryer, counter space, a sink and storage. The master suite has cathedral ceilings, a king bed, TV, large walk-in closet, en suite bath with large soaking tub, and a separate walk-in shower. Access your private balcony via sliding glass doors, where you can fully enjoy the view with a morning cup of java or a glass of wine - after 5, of course! The first guest bedroom has two twin beds, one with a trundle. The back bedroom has a queen-size bed and flat panel TV and shares a “Jack & Jill” hall bathroom with shower/tub combination. All three levels of the home have ample outdoor space to enjoy sunshine and views! On the boardwalk, the ground-floor patio offers a comfortable space for people watching and enjoying views of the surf. An intimate second-floor balcony off the master is ideal as a leisurely escape. The home’s crowning touch is the rooftop deck with near 360-degree views of the ocean, bay, sunrise, sunsets, Fashion Island and Newport Coast. Grill your favorite meals on a brand new built-in BBQ while guests relax in the hot tub. The deck also has a mini-fridge, sink and table with umbrella & chairs and a lounge chair. The garage has room for two cars, but extra-long SUVs and pick-ups may not fit due to built-in cabinets. Open the gate on this stylish beachfront home, cross the boardwalk and the sand is at your toes. Walk to dozens of shops and restaurants at Newport Pier. Pick up fresh seafood at the nearby Dory Fleet Fish Market at the base of the Pier, selling the day's fresh catch since 1891. Jane’s Corndogs has been serving up decadent goodies for decades and Seaside Donuts makes donuts 24/7 (the glazed blueberry are a Burr White favorite!). Many visitors consider breakfast at Charlie's Chili a must. Dory Deli has terrific lunches and people watching and you can't beat The Blue Beet for live music and their tasty menu. Go early in your stay to Fly ‘n’ Fish for amazing seafood or a steak at 21 Oceanfront because you’ll want to go back for a second or third visit. A week is barely enough time to explore all the area has to offer! This was my 1st time using Burr White Realty.I was grateful when I got to the 1st property and found it to be in deplorable condition that they immediately found me a better place...1904 W.Ocean Front for an upcharge. The location was waterfront which is what I wanted! Lots and lots of traffic =walkers,joggers,bikers,skateboarders thru day AND night.One entry key did not work at all and the garage opener did not work.The unit overall needs a MAJOR deep cleaning! !Black mold in 3 areas of master shower,window areas/screens are really dirty,master bedrm ceiling fan filthy,ice maker completely frozen up,outside screen door track completely rusted and screen not able to slide or close,several window handles broken and cannot open or close windows,several lightbulbs burnt out (kitchen island,standup lamp in den);toilet handle in master sticks when flushing and water keeps running. I chose not to complain during my short stay as I feel those things should be taken care of when there is not a paying guest there! Thank you for taking the time to share your feedback with us. We want every guest to have an exceptional stay in Newport Beach and certainly apologize that your stay did not meet your expectations. Our maintenance staff has been notified of the issues you brought to our attention. We look forward to seeing you again on your next Newport Beach getaway and look forward to the opportunity to provide a more relaxing and enjoyable experience. Hey Jacqueline, We are so happy you enjoyed your stay and look forward to seeing you on your next Newport Beach vacation! My family and I had a wonderful time staying at this well located and kept property in Newport Beach. Michael, Thank you for taking the time to review your stay with us. We are so happy to hear you had a great time in Newport Beach. We look forward to seeing you again for your next vacation in Newport Beach. The house was not ready at check in. This was a big inconvenience since guests had traveled from out of state and we had frozen foods ready to go at check in time. Management was not overly concerned and did eventually say they would refund the cleaning fee. It hasn&#x2019;t happened yet, but I trust that the transaction will take place. The house is nice and it is a &#x201C;beach house&#x201D; so I expect it to not be in perfect condition, but the price is high and maintenance is needed by the owners. The spa was dirty and in poor working condition, the lights on the rooftop do not work, and water spurts out of the irrigation system where there are no plants to catch it, but everything gets wet. The rooftop is very nice, but the furniture is in bad shape. We had a very good time because we always do, but the house needs repairs! Owner should consider upgrading the ac since it gets very stuffy upstairs even with the windows open. Running toilet in the master was a nuisance, as well. The umbrellas and beach equipment was a nice touch. Spent the week with family including young grandkids. Had great time. Beautiful setting and close to action around the Newport pier...but not too close. Gets a little noisy on the weekends. Unit was great and was in the condition you might expect for a beach property, i.e., generally clean and well maintained, but had some relatively minor things needing attention (refrigerator/freezer, windows). Hot tub and bbq on the roof were great. View from master bedroom unbeatable. Overall, wonderful. We are happy to hear that you enjoyed your stay in Newport Beach! Thank you for sharing your feedback, our maintenance and management staff have been made aware of these issues in order to correct them as quickly as possible. This was a learning experience. Renting on the boardwalk can be intrusive. People look into the windows as the stroll gets loud at night,people out drinking then letting loose!The property was clean, not to my standards. There were numerous repair jobs that could be done. The cords to the blinds were so gross I did not want to touch them. There was a drawer in the refrigerator that was broken and the ice machine was so full of old dead ice it was blocked up! The twin beds in one of the bedrooms are definitely not big enough for adults. the description says it sleeps 7, we could not tell where the 7 person would go. She slept on the very uncomfortable sofa for one night then went to a friends house for a real bed. We didn't discovery the 7th space until i was on my hands and knees and found a rollout bed under one of the twins! No need to say more oh except there were cobwebs in the master bath shower! Biggest disappointment ever! Do not stay here it should be taken off the rental program for a complete remodel.